There is always time for chocolate and I think the tart meets the criteria. Whats not to love about chocolate and sweet pears? This recipe works well with poached pears or tin pears and the great thing about it, is that you don’t need to blind bake the pastry before baking (yeah). If you use tinned pears, you can cut down the prep time and it will be melting of the chocolate and the freezing of the pastry in the tart tin that will take the majority of the time. I have made this tart a few times now and it hits the spot every time. This tart is wonderful with a wee cuppa, or as a nice slice served with vanilla ice cream for a very decadent dessert. I had some friends around last week and decided that this would be the dessert of the evening, it was a major hit and I have been asked for the recipe, so I thought it was about time, I finally wrote it all up and you can all enjoy making it as well eating it. 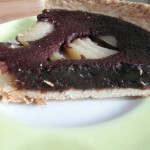 Another great thing about this recipe is that you can make individual tarts, all the steps are the same, it is just the size of the tart tins that are different, place only 1 sliced pear in the tart tin and carefully pour the chocolate sauce around the pear and bake. Cut the time down to 30 minutes, checking at 20 minutes and then a 5 minute intervals. You will succeed in impressing all your friends with this chocolate and pear tart, its relatively simple to prepare and looks and tastes fantastic. Not the best pictures, so I will need to bake another one, even if it is just to take some new pictures. 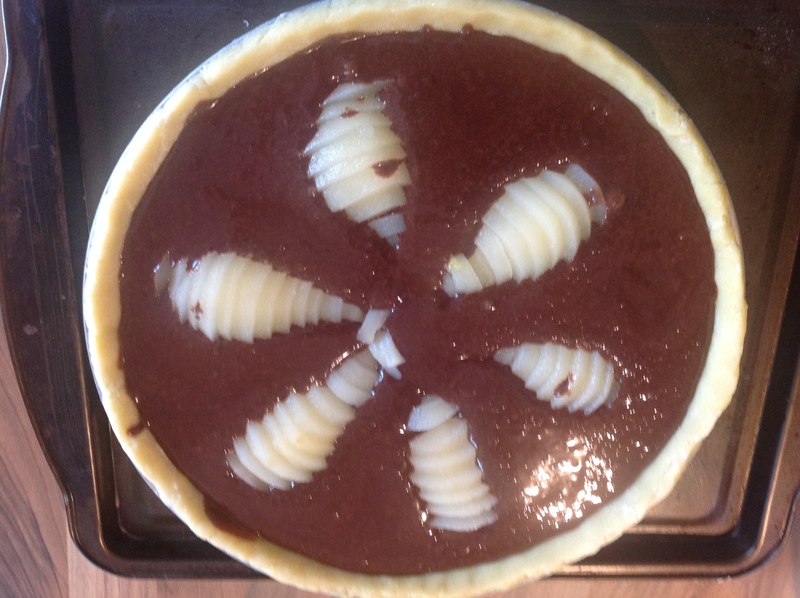 Rich decadent chocolate tart with sweet poached pears, ideal for a dinner party or with a cup of tea in the afternoon. In a food processor, add the flour and sugar and mix together. Add the pieces of cold butter on top and pulse until the largest pieces are the size of peas and the mixture looks crumbly. Working quickly, with the motor running slowly pour the egg into the dough and run until the dough comes together. If the dough is too dry, add a tablespoon of iced water. Turn out onto a lightly floured counter and knead lightly, just to incorporate the dry ingredients. Wrap in plastic wrap and place in the fridge. Butter a 10-inch/22-cm loose bottom tart tin. Roll the dough to slightly bigger than the tart tin (including the sides) . The dough should cover all the sides but not lose its crumbly texture (in other words, don't work with it too much or the pieces of butter will melt). Place the tart tin in the freezer for 1/2 hour. You can use canned pears or poach the pears as per the details. Peel, halve and core the pears. Bring the water and sugar to a boil in a large saucepan and stir until the sugar is dissolved. Add the tsp of vanilla extract and stir to combine. Gently place the pears in the water, (add more water if needed to completely cover the pears), lower the heat and place a piece of grease proof paper on top of the pears, simmer until the pears are just tender when pierced with a sharp knife (but not mushy), around the 10-15 minutes. Drain the water and set the pears aside. Whisk the egg and the egg yolk lightly in a medium-sized bowl. Add the vanilla and whisk to combine. Pour the cream into a heat proof bowl and add the chopped chocolate, place in a double boiler (or a metal bowl set over a pot with an inch of gently simmering water so that the bowl bottom doesn't touch the water) melt the chocolate with the cream, stirring and folding with a heat-proof spatula to combine into a smooth and shiny ganache. Stir in the sugar and cook a few minutes more, until the sugar has melted. Set aside to cool slightly. Slowly pour about 1/2 cup of the chocolate mixture into the eggs, whisking constantly. This warms the eggs, preventing them from cooking. Add the rest of the chocolate in a steady stream and stir to combine. Preheat the oven to 180c. Remove the tart dough from the freezer. Carefully transfer your pear halves to a cutting board, carefully slice into thin slices, across the pear. Using a large knife or wide spatula, transfer the sliced pears to the pastry case, it should be equal distance between the rim of the pastry and the center of the tart. Once in place fan out the pear slices, press the wide end of the pear gently towards the narrow end. Pour the chocolate mixture around the pears into the tart tin, (not on top of the pears). Bake for 50-55 minutes or until the chocolate custard is puffed and set (it will be firm to the touch and slightly cracked around the edges). Cool on a wire rack for 10 minutes. Remove the tart from the tart tin and slide onto a plate. If desired, brush the pears with a little bit of melted apricot jam to glaze and then sprinkle with powdered sugar before serving. Serve warm with lightly-sweetened whipped cream or vanilla ice cream.